Click on photo to open page. The Path to High Potential. 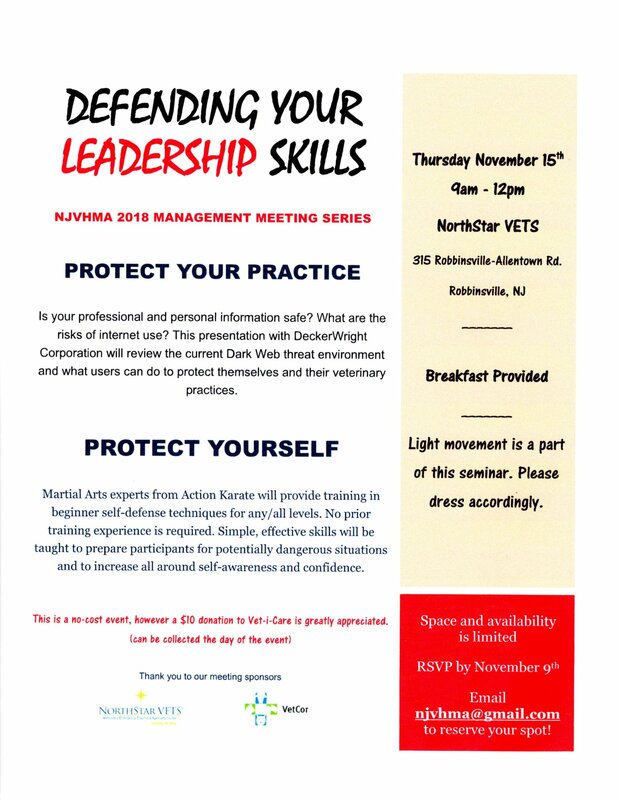 Two day seminar for veterinary practice managers and owners. Seating limited. 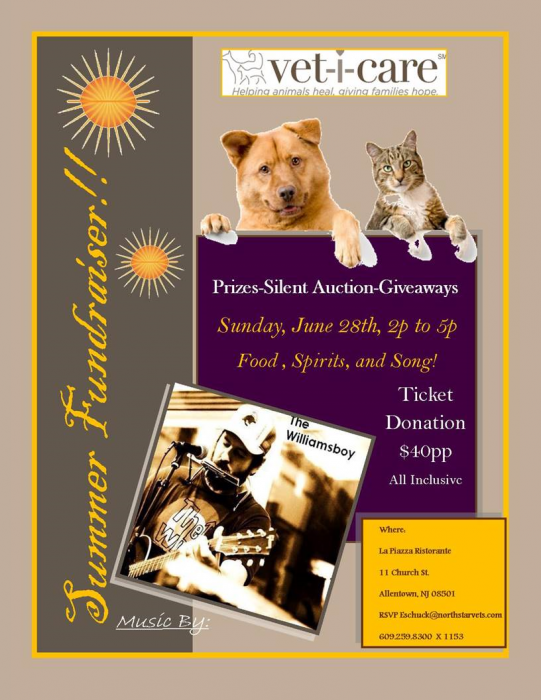 RSVP now! 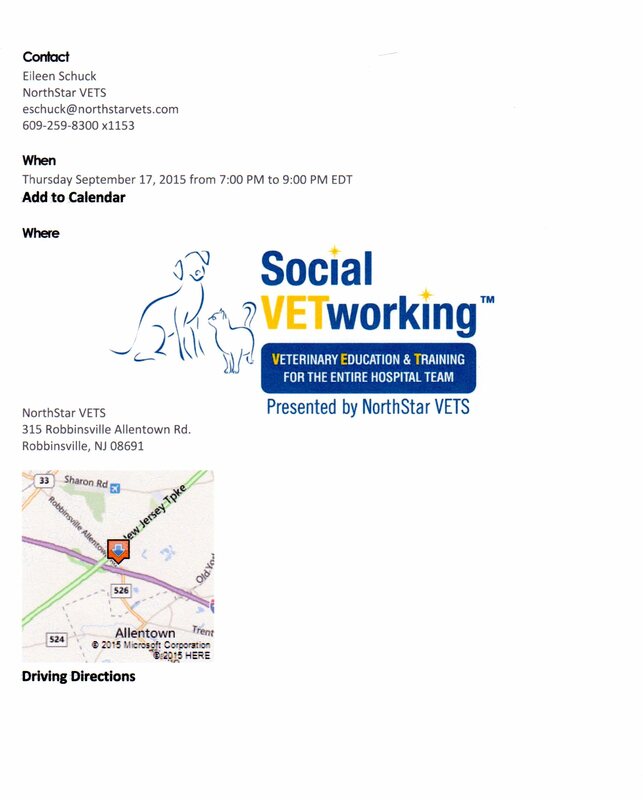 Registration is open for the NJVMA 132nd Annual Meeting. 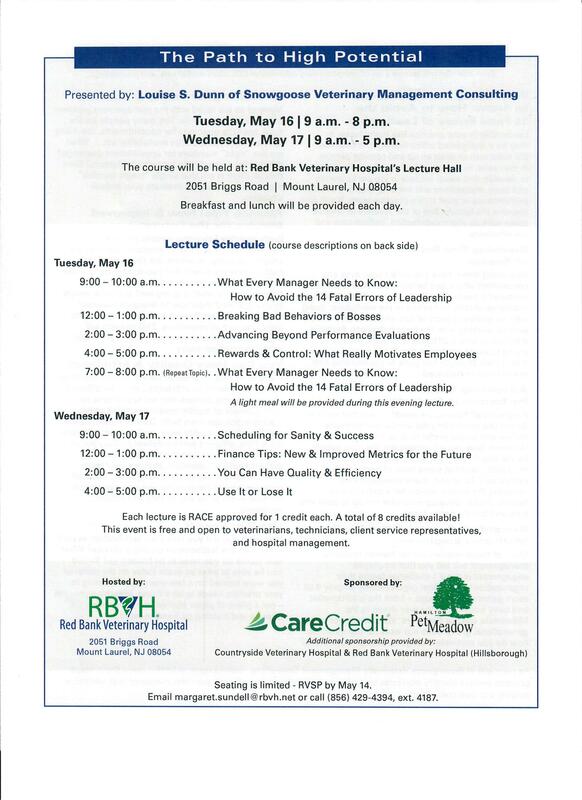 The program offers 10 hours of CE (5 hours/day) featuring renowned speakers covering companion animal tracks, technician tracks and practice management topics. 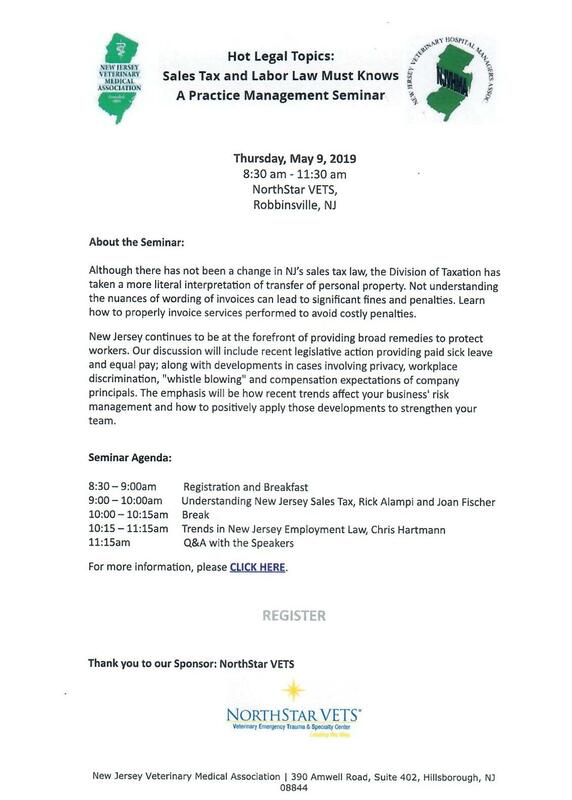 NJVHMA has pushed for more management and HR programs at this venue. We are pleased that we have had a great response to our request. Saturday March 12, 2016 Ms. Denise Tumblin – Wutchiett Tumblin & Associates will be lecturing all day on Tip and Tricks to increase revenue. 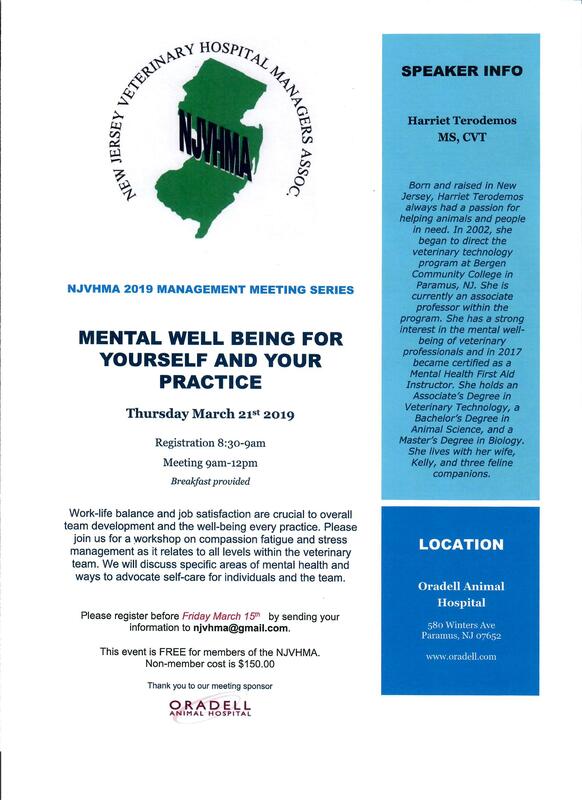 Sunday March 13, 2016 Ms. Julie Squires – Rekindle, LLC will be lecturing on Compassion Fatigue. Both lectures should be a great meeting. We need you to help us continue to get more topic speakers and topics at this venue. If you can't make both days, sign up for one day meeting. You won't be disappointed. 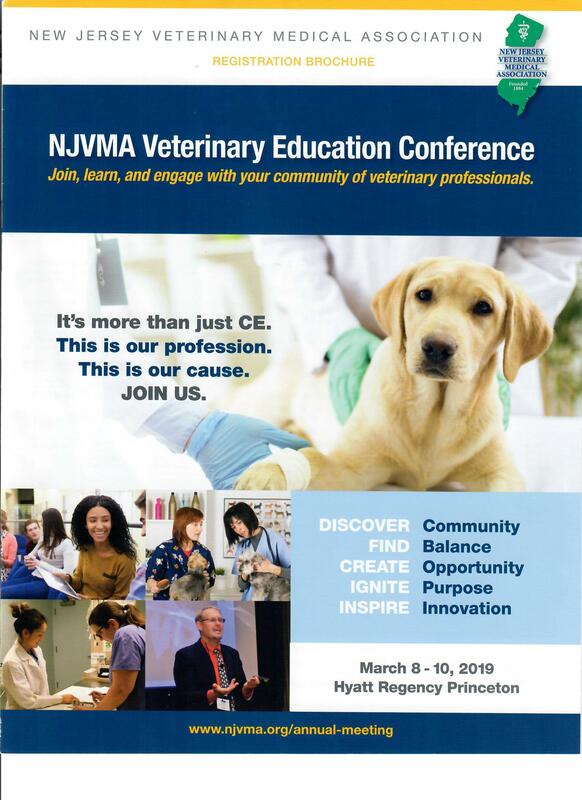 Full Veterinarian and Technician/Office Staff Registration includes: breakfast, lunch, dinner & entertainment on March 12th as well as breakfast and the 21st Annual Animal Hall of Fame luncheon on March 13th. Join us at the President's Reception on Friday, March 11th and the ever popular NJVF Silent Auction and cocktail reception on Saturday, March 12th! Link for registration: Click here. Practice Management for Saturday March 12, 2016, Sunday March 13, 2016. Cardiopulmonary Resuscitation in dogs and cats. 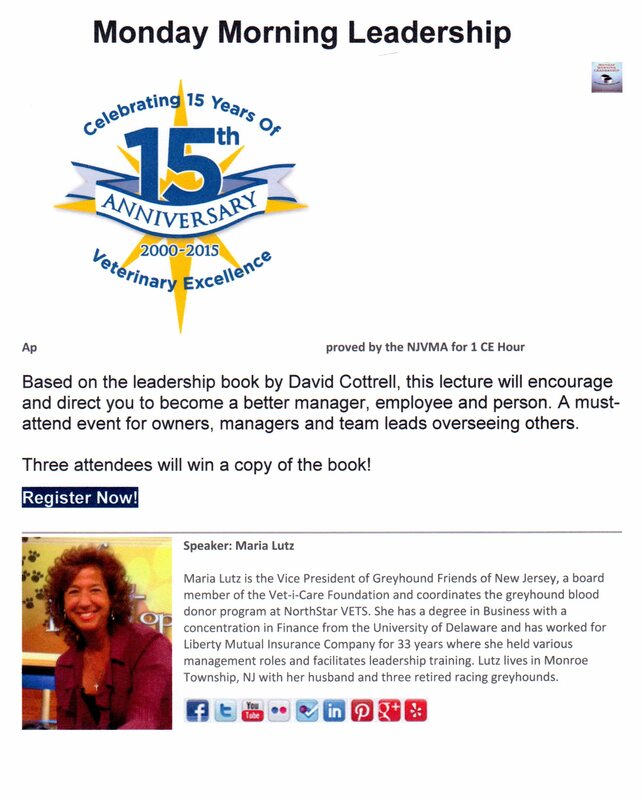 WE INVITE ALL VETERINARIANS & TECHNICIANS TO REGISTER NOW FOR 3 DAYS OF EXCITING CE EVENTS! REGISTER HERE ASAP to lock in your place. 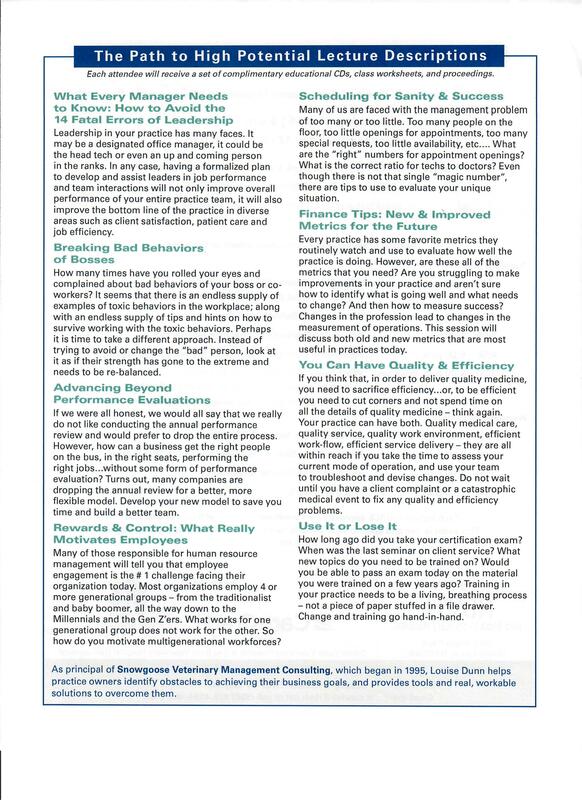 This program is designed for managers or those who oversee management duties. The four management classes will enhance managerial skills, leadership and confi dence. Participants receive knowledge and tools that will have an immediate impact on practice performance. August 12-13, 2015 Human Resources September 16-17, 2015 Inventory and OSHA October 7-8, 2015 Marketing November 4-5, 2015 Finance.